Murder by Gaslight: The Horrible Murder in Division Street. We are becoming so used to the reign of ruffianism that it requires some outrage of unusual barbarity to thoroughly arouse our indignation. But even the meekest citizen will be of opinion that the murder of Augustus Brown, on Saturday night, ought to be followed by vigorous action looking towards the suppression of rowdyism.It will not do to allow gangs of loafing ruffians to assemble at street corners and insult peaceable passers-by. As we have before pointed out, these assemblages are constantly leading to murder and robbery. The judicial authorities are as much to blame in this matter as are the police, for the cure for this crying evil is very simple. 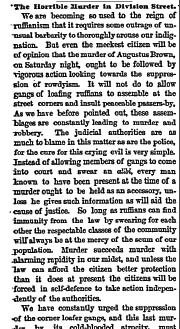 Instead of allowing members of gang to come into court and swear an alibi, every man known to have been present at the time of a murder ought to be held as an accessory, unless he give such information as will aid the cause of justice. So long as ruffians can find immunity from the law by swearing for each other the respectable classes of the community will always be at the mercy of the scum of our population. Murder succeeds murder with alarming rapidity in our midst and unless the law can afford the citizen better protection than it does at present the citizen will be forced in self-defense to take action independent of the authorities. We have constantly urged the suppression of the corner loafer gangs, and this last murder, by its cold-blooded atrocity, must bring home to every man the necessity which exists for the course we have strenuously recommended. The best was of striking terror into the gangs of rowdies by whom we are beset is by making every individual responsible for the crimes of his companions. There can be no just objection to such a course; it is followed in all cases of crime against property, and ought to be enforced with double stringency incases of crime against the person. If one of a gang rob a house the whole gang may be punished, and if one of a gang commit murder his companions and encouragers ought also to be exposed to the action of the law. If the judges and juries would act on this principle for six months and decline to be influence by representations of politicians, the violence and aggressiveness of our rowdy population would soon cease. "The Horrible Murder in Division Street." New York Herald 11 Jun 1872: 7.